The NESCO 18 Quart Roaster Oven is ideal for roasting up to a 22 lb turkey. It’s also perfect for large size recipes when you have a sizable group to cook for. This recipe for Creamy Herb Pasta serves 25 guests and is extremely easy to make. Simply add all the ingredients, cook for 45 to 50 minutes, and enjoy. 1 cup butter or margarine, room temp. 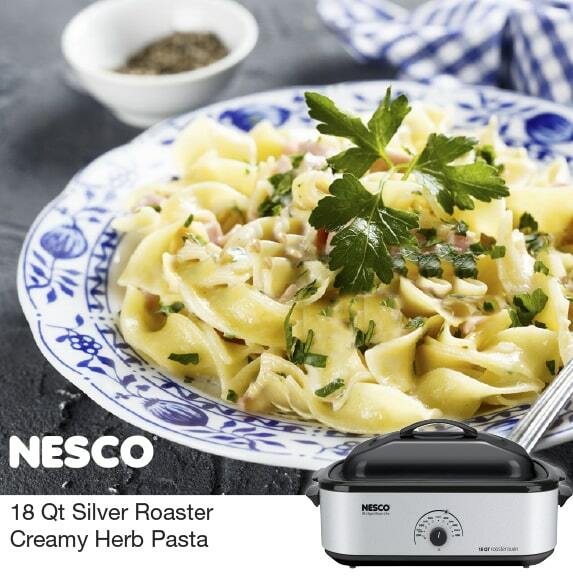 Preheat Nesco® Roaster Oven to 425° F.
Combine all ingredients in cookwell; stir gently until well mixed. Cover; bake 45 to 50 minutes or until set. To hold: Reduce temperature to 250° F and add milk if pasta begins to dry out.